Welcome to Lake Land Hotel Mizuenosato. 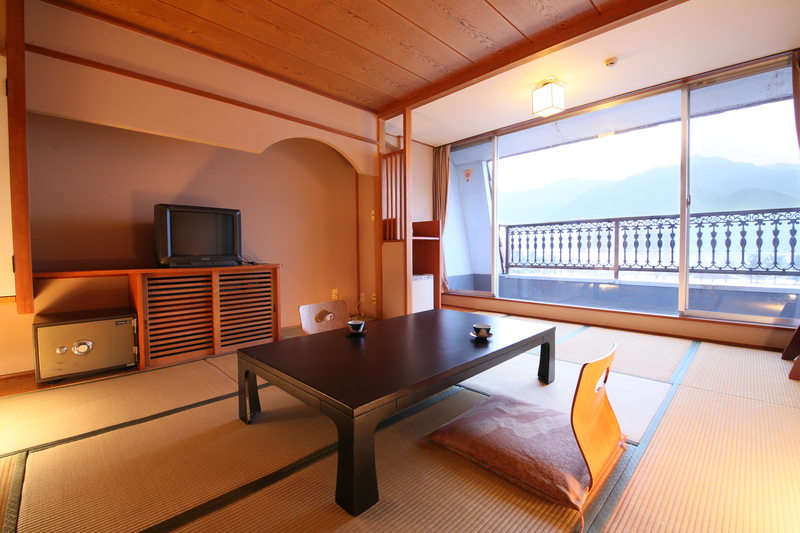 This Ryokan Hotel is located on the Lake Kawaguchi and offeres wonderful views of Mt Fuji. 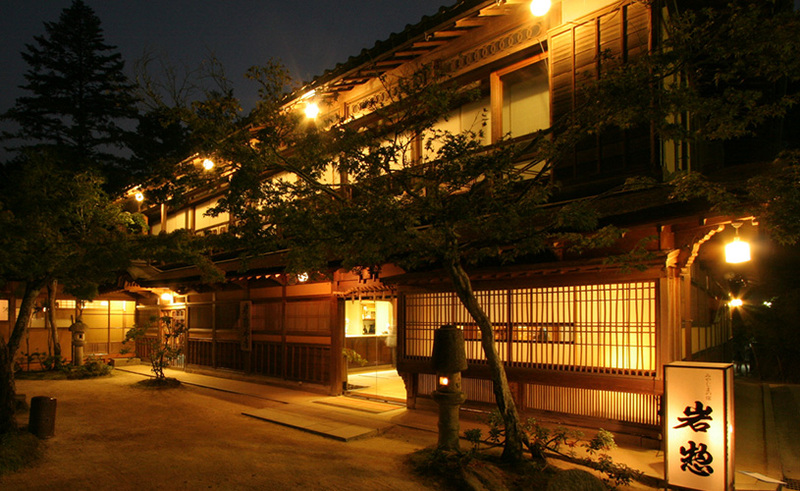 This ryokans has many hot spring baths for you to enjoy including an open-air bath and an open-air Jacuzzi. Meals are served in the ryokan's dining room with views of the lake. Check in time is after 15:00 and check out time is before 10:00. This was the costliest among the accommodations we booked in our trip, however it was in the end well worth the heftier price tag. The ryokan is a long-ish walk from the train station, especially in the cold, but in return the ryokan stands right alongside the Lake Kawaguchiko where the surroundings are very beautiful. It is also possible to call and arrange for a shuttle van to pick you up if you can speak Japanese. The "retro buses" that plow the area also stop right across the road from the ryokan. The food was some of the best we had in a hotel/ryokan, with the dinner japanese meal even uncharacteristically including a buffet component. Our room faced the lake - and thus away from Mt Fuji since the ryokan is between Fuji and the lake. This wasn't much of a let down though as the lake view was beautiful. The room was clean and comfortable and among the more spacious of the ryokans we've stayed in before. We didn't go for the rooms with private onsen baths, but the shared ones were all kinds of great, thanks in no small part to the beautiful scenery all around the ryokan. 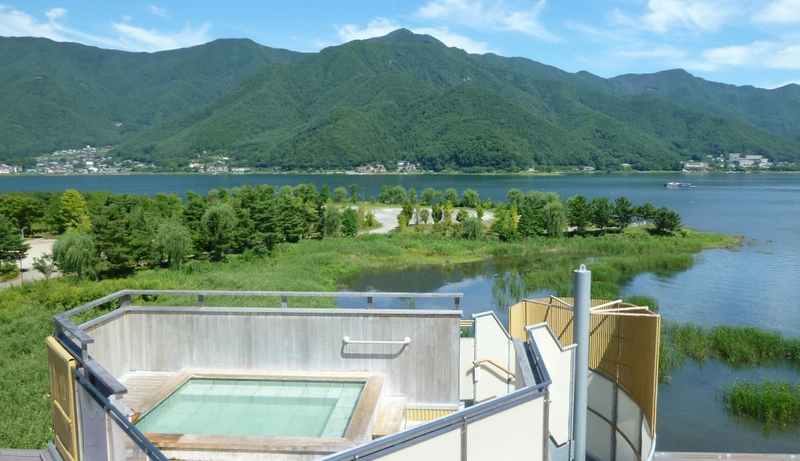 The rooftop "Amanogawa" bath in particular really oughtn't be missed. It was closed during the day when we stayed because of slippery ice but I was able to use it when it opened up later in the night. Sitting in a little pool of hot water with nothing but great, starry vastness above and all around was incredibly sublime. Easily one of my best onsen experiences. There is also a viewing deck at the very top floor that shouldn't be missed - it offers a magnificent 360 degree view that encompasses the lake, Mt Fuji and the mountain ranges in between. All in all we had a great time. A recommended stay if you have the budget for it. We stayed in a Japanese-style room with a private hotspring on the balcony. This was extremely expensive but totally worth it. 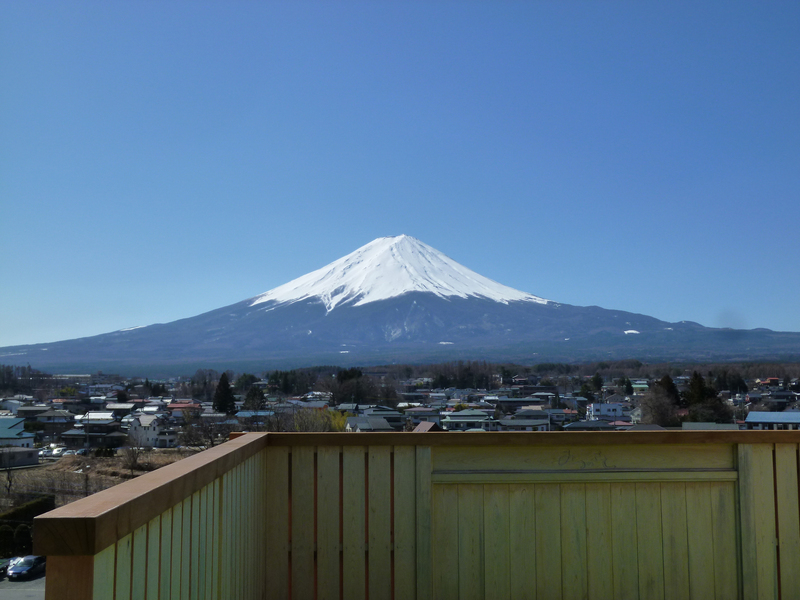 We had a beautiful view of Fuji-San, a spacious room, comfy futon and delicious food. The viewing deck at the top of the hotel is amazing, the staff always friendly and helpful- they took us to Fuji Q Highlands because we couldn`t get a taxi or bus- completely free of charge. The Hot Spring is perfectly comfortable for a couple however in the summer the spiders in the roof decking are numerous and belligerent- so if you`re afraid of crawlies, try not to look up. Apart from that, the perfect place to treat yourself, relax and unwind. Kawaguchi lake is right outside the hotel and beautiful to walk around. Even though this accommodation was easily the most costliest part of our trip it also was the best part of my and my brothers trip to Japan. Ryokan had its own transportation from train station to ryokan for free if you have a lot of luggage. We only had our packbags so we decided to walk around and see the neighborhood before going to ryokan. The walk is around 15 min and it's going downhill so it's easy to go. Ryokan also is easy to find if you have the map. We just took picture of a map from station. As we took our first steps in the ryokan we immediately got greeted by the staff and we were asked to take a seat for a second. Staff used perfect english and were really polite. Our room was Japanese-styled and it was exactly what we hoped it to be. The main room was big and confy and had this old Japanese feeling which we were looking for. If something should be changed I would have dropped the tv out of the room or maybe changed it to radio. The main thing we chose Mizunosato was hot springs. We had never been to hot springs before so we tried to enjoy most of them. With hot springs there also was a sauna. Sadly sauna didn't have a pail to get greater heat in it. 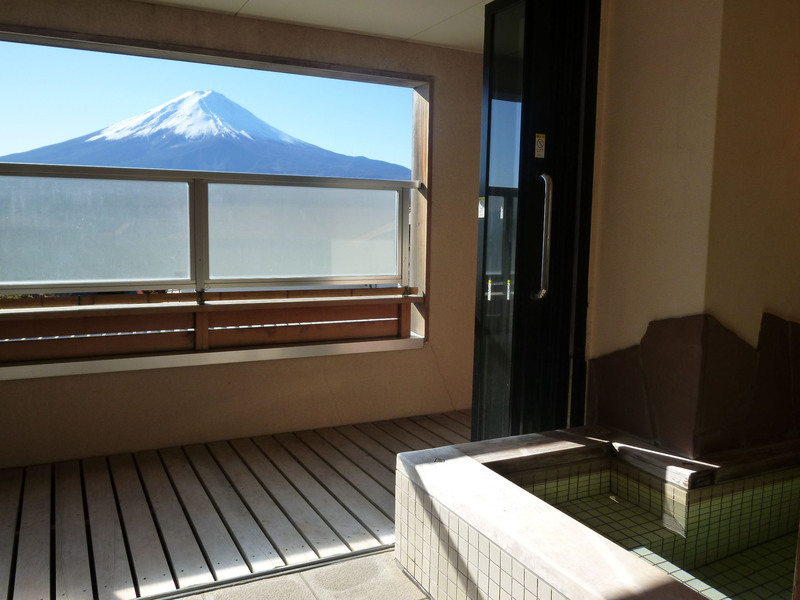 There also was an open bath on the roof which had great view to mt Fuji. Sadly one could only see the view if he/she would be standing. I would have wanted to sit in the bath and enjoy the view and nice wind wich sadly was blocked by high wall. Dinner was amazing. We had traditional japanese meal and we had 3 different kind of meal types to choose from. With traditional meal there also was a buffet with traditional hotel foods and japanese foods as well. Breakfast was buffet only, but there still were plenty to choose from. If you want to go with your entire family next to lobby there is a room for children and for older kids there also is little arcade styled gameroom downstares. Overall the hotel was amazing and we are hoping to visit it again. I like to travel on my birthday, and I spent the day in Kawaguchiko. This ryokan was a great choice for it's food and staff, but I had a few issues with my room. I was given a western style room which was rather run-down looking, and the heat was on full blast and I couldn't figure a way to turn it down. But other than that, this is a great hotel. The food was delicious, the staff was very courteous and helpful, the onsen was very relaxing, and the location was great being right on the shore of Lake Kawaguchi. They helped make my birthday very memorable. Yesterday evening we arrived at Mount Fuji. The pick up from the station went well and the Lake Land Hotel welcomed us. We than got into our room, had a look at the public bath and had dinner. For this amount of money we would have expected after 2,5 half weeks of traveling in Japan, 3 relaxing days at Fuji with the most expensive accommodation we have booked during our stay. And this is what we actually received. A hotel and rooms with interior which looks 20 years and older (some examples attached). Old can be really nice and pretty, but than all the things have to be in good conditions. Not only the tatami mats and the TV. The room smells like a smoking room. I guess it's a non smoking room, but maybe 5 years ago it had been one. The balcony and the sitting place in front of the window looks dirty and we saw some spider net. Although the wifi is not working in our room. This would be fixed a day later. The public bath is not special but ok. The dinner was ok (we don't have to leave hungry) although far away from special at the first night. We had have better shabu shabu. We had definitely better sashimi and sushi. And we had better small little dishes. And all for less than 4.000 yen for two persons. (Just for the record we had better meals but also no one which was worse. All in all in Japan you get really good food.) So if I count all things together we are more than a little disappointed with our booking and stay at a ryokan which we expected to be the best stay of our trip. So we complained about the gap between our expectations and the reality by japaneseguesthouse. They react prompt and we changed the room on the next day to a supreme room - modern, large, western beds and in good conditions. The view changed from lake to mountain view. So we had a great look at the mount Fuji in the morning. And we don't now if it was because of the complain, but the meals in the evening changed to amazing different little dishes - a lot more than we could eat. So it good better and we enjoyed the stay. Location and view were simply outstanding. Staff was welcoming and even arranged pickup/drop-off at train station free of charge. Bath's were well kept and quite nice. The food was a big letdown. A small collection of Japanese dishes as well as a large amount of western dishes on a buffet line of varying degrees of quality, which left much to be desired. I stayed in one Ryokan before LakeLand and the food was incredible. Unfortunately, the food here was poor and, if I ever stay here again, I would certainly pass on all meals. Aside from the food, everything else was amazing!